DTS (also known as Digital Theater System(s)), owned by DTS, Inc. (NASDAQ: DTSI), is a multi-channel digital surround sound format used for both commercial/theatrical and consumer grade applications. It is used for in-movie sound both on film and on DVD, on CD and during the last few years of the Laserdisc format’s existence, several releases had DTS soundtracks. Dolby Digital, or AC-3, is the common version containing up to six discrete channels of sound. The most elaborate mode in common usage involves five channels for normal-range speakers (20 Hz-20,000 Hz) (right front, center, left front, right rear and left rear) and one channel (20 Hz-120 Hz) for the subwoofer driven low-frequency effects. Mono and stereo modes are also supported. AC-3 supports audio sample-rates up to 48kHz. Batman Returns was the first film to use Dolby Digital technology when it premiered in theaters in Summer 1992. The LaserDisc version of Clear and Present Danger featured the first Home theater Dolby Digital mix in 1995. DTS is adopted by DVD specification later than Dolby Digital AC-3, so some older DVD player or hi-fi system only support AC3. To play DTS in these systems, you need convert it into AC3 format. For other users who want to enjoy their splendid DTS musics in their portable devices like iPod, iPhone, iPad, Android, etc and popular players like Windows Media Player, QuickTime, PowerPoint, etc, converting DTS to AC3, MP3, AAC, WAV and FLAC etc is a customarily and highly recommended way to play DTS files anywhere without limit. DTS (Digital Theater Systems) encoded audio or video files are incompatible with most media players or portable devices as we mentioned above. In order to successfully play DTS audio anywhere, a recommended solution is to convert DTS to more popular audio format like convert DTS to AC3 with a powerful DTS Converter- Pavtube Video Converter (Mac version is also available). Step 1: Download and install the corresponding program. 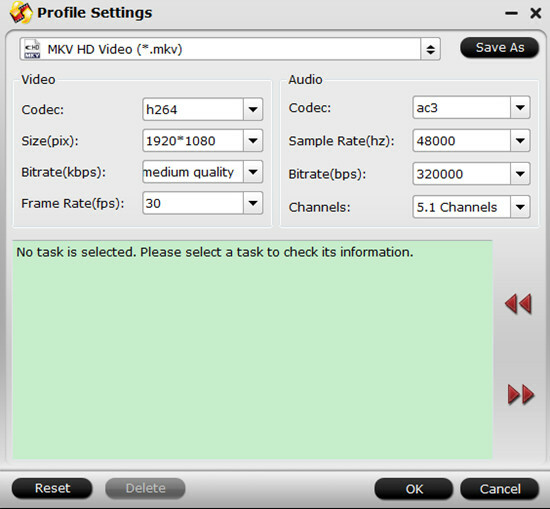 Click “Add video” on the main interface to load MKV files to the program. You can also drag the files to the program’s window list directly. This program can also support the batch video clips. Step 2: Select the right formats for output. 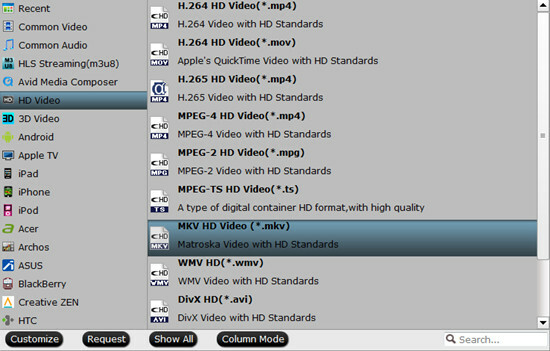 In order to keep the video intact, here we suggest you to go to the “HD Video” list, you will get the “MKV HD Video (*.mkv)”as the best output. Step 3: By clicking the “Settings” button, you can convert audio stream. Choose “ac3” as audio codec and “5.1 Channels” as Channels. You can also choose “Mono” or “Stereo” as channels. It depends on you. Step 4: At this point, you can change the output filename or output path if you wish. If you feel satisfied with your options, Just hit the “Convert” button to activate MKV DTS to MKV AC3 conversion.